The Review: I remember a time when Hallowe’en wasn’t just an excuse to churn out another half-baked sequel in a scary movie franchise. Simpler times, but money talks and the only thing that managed to derail the Saw series from picking up massive opening weekends seemingly unrelated to the actual quality of the movie was another crowd pleaser full of seasonal frights, but which this time jumped on the back of the “found footage” craze. Paranormal Activity had such an impressive box office to cost ratio that a sequel was inevitable, but how can you make money a second time round, without just regurgitating the same concept? To an extent, this does its fair share of regurgitating in that we are still looking at video footage recorded overnight, but the writers (and producer and returning writer / director from the original Oren Peli) have attempted to retain what was so successful about the original while expanding the concept. That expansion actually works backwards in time, as this is a prequel, and it comes as a certain surprise to see the two lead characters from the first movie returning, but the onscreen caption confirming this place in the timeline does lend another slender air of suspense to proceedings. 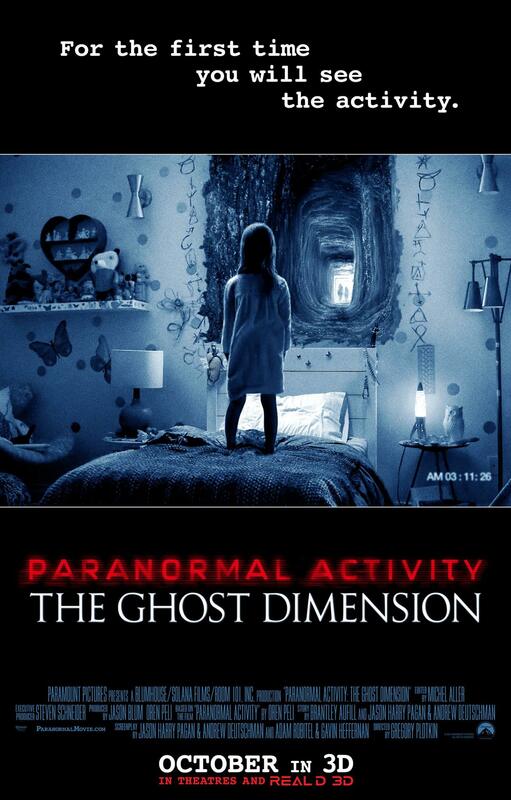 But what worked so well in Paranormal Activity was the gradual build of tension through the repetitive structure. By edging up the drama each night, the slow burn nature gradually took its grip on, let’s be honest, some rather gullible audiences, but part of the fun was being caught up in the reactions of those around you. The sequel retains this concept, but with a succession of five cameras spread around the house that are cycled through, allowing you not only the same chance to spot what’s going to cause the scare, like a sort of horror “Where’s Wally?”, but also to speculate on which one is actually going to offer up the scares. It was also that sense of found footage that helped those more susceptible to fully engage with the original experience, and sadly this is where the sequel compromises in two key areas. Rather than characters played by complete unknowns, we have one played by Sprague Grayden, a.k.a. the manipulative daughter of President Taylor from TV’s 24. The original also dispensed with credits in an effort to maintain the façade; sadly this tries to have its cake and eat it, with a long black screen at the end, but only the most sprightly front row patrons will be out the front door by the time that Sprague Grayden’s credit appears on screen. There’s not much more to say – if you enjoyed the first one at the cinema, and can find a big enough crowd willing to open themselves up to this, then the downsides are offset by some slightly more effective scares and a satisfying extension to the mythology. Amazingly, this franchise might not be on its last legs yet – didn’t see that coming. Why see it at the cinema: This is a 7/10 experience rather than a 7/10 movie, in all honesty; any attempt to watch this when not fully surrounded by the company of like-minded people, with a large enough proportion jumping out of their skin at the appropriate moments, will completely diminish the effect. This entry was posted in Reviews and tagged Brian Boland, found footage, horror, Katie Featherston, prequel, Sprague Grayden, Tod Williams.